CIMB Research has downgraded Mah Sing Group Bhd to a sell (previously a hold) at RM1.55 as the counter had been a big performer and earnings growth had been gradually revised to single digit only. The research house said while the sell call was largely driven by its bearish outlook for the property sector, it still had the highest regard for the company and might upgrade it sometime later when prospects for the overall sector improve. It said the derating catalysts included continued delays in wrapping up the en bloc sale of Icon Mont’Kiara and the overall weak market sentiment on properties. CIMB Research said it made no changes to its earnings forecast but had lowered Mah Sing’s RNAV (revised net asset value) to RM1.66 from RM2.10 after accounting for the gradual exhaustion of its landbank and stripping out the development value of Icon Mont’Kiara as a result of the delay in the completion of the en bloc sale. “As a result, we have lowered our target price from RM1.78 to RM1.41 based on an unchanged 15% discount to RNAV,” it said. The research house said Mah Sing was the best performer in the property sector last year as it fell 17% compared to the sector’s plunge of 50%. 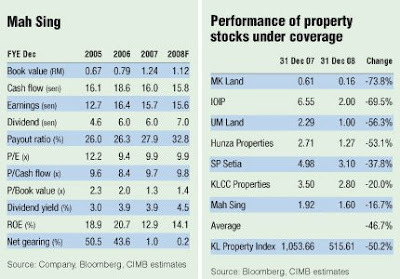 CIMB Research, however, said the fundamental outlook for the property sector for 2009 remained tricky and this could weigh down the stock. “While it is true that construction costs have eased due to the fall in steel prices and transport costs, our overriding concern is demand which will remain soft due to weak sentiment. 2008 was mostly a washout year for property sales, particularly after the March 2008 general elections. “But earnings may come under even more pressure as another year of depressed sales in 2009 will gradually exhaust unbilled sales,” it said. The research house said while prices of physical properties had held up relatively well, developers’ sales continued to deteriorate, adding that many builders had postponed launches in 2009 while some have offered discounts to clear unsold stock. “The strategy adopted by many property companies is clearly a defensive one aimed at conserving cash in order to snap up bargains offloaded by weak landowners. “Although we believe prices of physical landed properties will remain firm, we are concerned about the condo glut in KLCC and Mont’Kiara. Mah Sing is fortunate to have locked in gains for its KLCC office buildings but it still has exposure to Mont’Kiara,” it said. On the outlook for the company, CIMB Research said Mah Sing’s prospects remained better than for most other developers due to its strong management and marketing savvy. The research house said despite the tough conditions in 2008, Mah Sing managed to chalk up respectable sales of RM367 million in the nine months to September 2008, adding that its Southgate commercial project was also a success and the group was close to securing an en bloc sale there. “Mah Sing has been consistently adding to its landbank, acquiring three parcels of land last year — one in Johor and two in the Klang Valley. It is eyeing more plots of land in Malaysia and is dipping its toes in Vietnam and China. That said, it is not in a hurry and will buy carefully,” it said. Mah Sing ended yesterday’s trading unchanged at RM1.55.